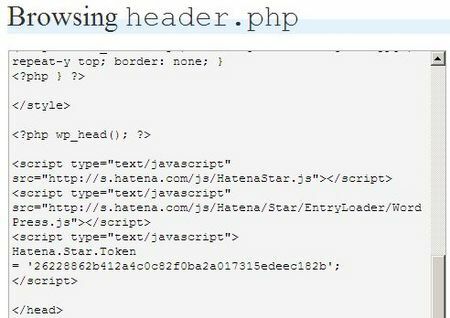 Setting up Hatena Star for WordPress. Next visit "Presentation" page on WordPress and select "Theme Editor"
Click "Header" on the right side of "'WordPress Default' theme files." Please replace your TOKEN with your TOKEN when you found your Hatena Star Blogs page. An example WordPress site is here. Hatena Star Diary(WordPress) ≫ Blog Archive ≫ The new Stars page now lets you view a history of Stars you have added..